Christmas is the most profitable time of the year for retailers. Consumers spend more money decorating their homes and gift giving than any other time of the year. 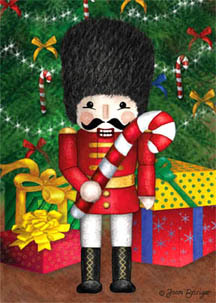 Thus, Christmas themed art on products are a huge category in licensing art. 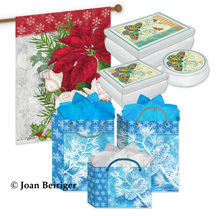 And using colors and Christmas motifs that are popular with consumers are important when creating art for products. However, trends that are predicted to be "hot" by trend experts may not be as important. As with all product categories, artists must do their homework in learning which manufacturers follow trends and which ones use traditional designs and color for their products. For instance, manufacturers that license graphic art on greeting cards tend to use more trendy colors and motifs than manufacturers that produce fine art greeting cards. Below are discussions about color, motif, and word trends used in Christmas art. There are several trend services that predict trends for different product categories. One is The Trend Curve and the international authority on color and design trends in home furnishings. Michelle Lamb the co-founder and editorial director of The Trend Curve attends major trade fairs around the world to help her forecast trends in color, patterns and designs. She predicted that the Christmas color for 2011 would be silver and a light shade of green as stated by Debbie of Fancy House Road blog in "2011 Christmas Decor Trends: Silver and Green." And Interior Holic agrees in "Christmas 2011 Decoration Trends." Most likely Michelle Lamb saw this trend at the spring Frankfurt Germany's huge trade show Christmas World. In fact, these colors are big in the Netherlands according to Marianne Songbird from the Netherlands in "Christmas Decorations Fashion Trends 2011." But, even if silver and light green are "hot" 2011 Christmas colors in Europe are they in the United States? I sure did not see it THIS year. Some of the articles that I read suggested that retail stores would be decorated with these colors. I do not remember the decorations at most department stores but Kohl's used red and gold. And you would expect that store window displays in New York would follow color trends. But the colors used in the store fronts varied depending on the theme displayed and products shown. View "Christmas in New York 2011" to see fabulous window displays. Look at the side bar on the website to select various department store window displays. So just because a trend expert predict certain colors to be "hot" for Christmas does not mean manufacturers and retail stores follow them or can even implement that year's predicted trends because of the long lead time in their production schedule. Also most consumers cannot afford or wish to redo totally their Christmas decorations each year just to have the trendy Christmas colors in their homes. Perhaps Margery Stewart Baxter of Pro Flowers in "2011 Christmas Decorating Trends You Want to Know About" best states the use of trendy colors. ". . . A trend does not make a mandate. Stores are happy to satisfy Christmas shoppers of all styles, even the markedly "untrendy." And Beverly Fabrics blog proves that in "2011 Christmas Trends" because they show an array of Christmas decorating options and colors that should satisfy every consumer. 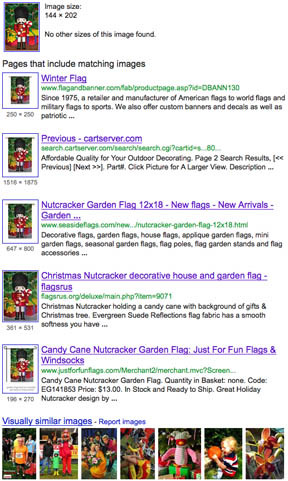 When searching the internet, I could not find any articles about trends for Christmas motifs. So I used the old standby and looked at Christmas products in retail and internet stores. Popular motifs seemed to be the ubiquitous Santa, snowman, reindeer, poinsettia, holly, candy cane, pine cone, cardinal bird, and snowflake. Also used were Christmas trees, gingerbread men, polar bears, penguins, ornaments, stockings, mittens, wreaths, and various birds and flowers. None of these motifs are new and have been appearing on Christmas art for years. As with a lot of art on products in todays market, Christmas art often incorporates words of hope and good feelings such as love, joy, celebrate, hope, and cheer. In recent years, the words "Merry Christmas" has been replaced with "Happy Holidays" on much of the art. This change is an attempt to make products appeal to a broader spectrum of consumers. America has become more religiously diverse and many non-Christian religions also celebrate around the end of the year. By using a more generic term such as Happy Holidays, products appeal to consumers that do not belong to a religion, belong to a non-Christian religion, or belong to a Christian religion. While it is important for an artist to be aware of the current trends in Christmas art, they may choose not to use them in their art. Using or not using trends depends on the art style and product. For instance, if art is created for the decorative flag industry, the predicted 2011 Christmas colors of silver and light green is not colorful enough. However, those colors would be perfect for elegant looking tabletop products. Artists should not depend on others to predict trends but do their own research by observing what colors and motifs are popular from Christmas to Christmas and then project what will be popular the following year(s). For example, penguins have been around for a while but they seemed to be on more products this year. Will they be on even more products next year? One method in tracking trends is to construct trend (mood) boards with retail and internet product advertisements. To see examples of trend boards, check-out UK's Advocate-Art licensing agency blog post "Christmas Countdown Has Begun ! Advocate Defining Christmas Trends (2012)." Make sure that you read the comments to this article. They are very informative! 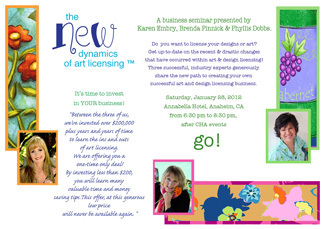 Seminar in Atlanta - January 12 "The New Dynamics of Art Licensing"
At the request of artists that cannot attend "The New Dynamic of Art Licensing" seminar in Anaheim, artists Karen Embry, Phyllis Dobbs, and Brenda Pinnick will also be offering one on January 12, 2012 in Atlanta. This is the day before the opening of the Atlanta Gift Show temporary exhibitors. They will discuss the creation of licensable art, portfolios, and marketing materials, color and trends, approaching manufacturers, and MUCH MUCH more. The seminar will be from 4 to 6 PM followed by optional private consultations. 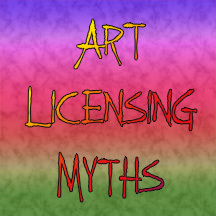 For more information read, "The New Dynamics of Art Licensing Seminar." HURRY and register because the early bird special ends on January 4. And if you haven't registered for the Anaheim seminar, do it soon. The early bird special for the Anaheim seminar ends January 14. Creating patterns for licensing to manufacturers in the fabric and paper industries are not the only uses for patterns. 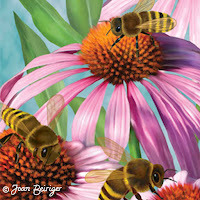 Many artists also apply them to backgrounds and motifs in their work to add interest to the art. 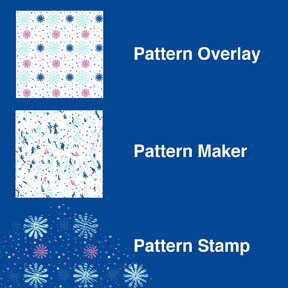 You can easily create your own custom patterns in Photoshop and save them in libraries to be used with the Paint Bucket tool, the Pattern Stamp tool, and the Pattern Overlay layer effect. Photoshop can also generate random tiled patterns with their Pattern Maker filter. A pattern is created as an image or a set of icons and is repeated (tiled). You can create your own custom pattern by using any motifs that are created in Photoshop or your own painted and scanned ones. You define the motifs as a pattern in Photoshop by selected the image with the marquee tool and select Edit / Define Pattern. 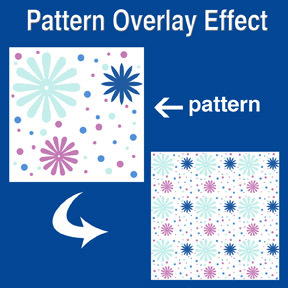 You apply the created pattern to a layer by selecting the pattern overlay in the blending options effects (Layer /Layer Style / Pattern Overlay) or in the layers window click on the fx symbol at the bottom and select Pattern Overlay ... to open the Pattern Overlay window. View "creating a Photoshop pattern" video to see a demonstration on how to create your own pattern and apply it to a layer by using the Pattern Overlay effect in Photoshop. The Pattern Overlay window allows you to adjust the scale of the patterns, the opacity, and use the Blend Mode effects. Note: As mentioned in the video, the layer cannot be blank but must have a color or image on it for the pattern to be visible. The color/image does not have to fill the entire layer. Hint: If you wish to have a transparent background for your pattern so that it can be used on any color or motif, make sure that the layer that the pattern was created on is transparent and none of the layers below it are visible including the background layer. The picture at the left shows the initial pattern that was created in Photoshop with the brush and custom shape tools on a white background. Notice that none of the icons are cut off but are within the boundaries of the sides. This is to avoid imperfect repeating when the pattern is tiled. As was stated above, the background could have been transparent when the pattern was created so that it could have been placed on any color background. The repeated pattern in the example was created with the Pattern Overlay and was scaled down to about 20% while in the Pattern Overlay window. Using the Pattern Stamp tool (located on the tool bar behind the Clone Stamp tool) is an easy way to brush a partial pattern onto the layer. This adds interest to a background or motif. The tool has several options (located along the top of Photoshop's window) - brush selection, layer styles (mode), opacity, pattern selection. 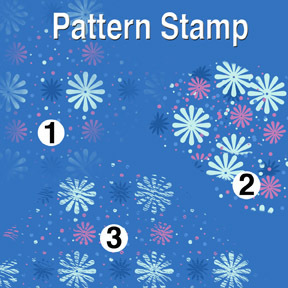 The only draw back to the Pattern Stamp tool is that the size of the pattern cannot be altered as it can in the Pattern Overlay. View the video "How to use pattern stamp tool in Photoshop (CS5 CS4 CS3, CS2 etc) tutorial" on how to use the Pattern Stamp tool. Note: The mouse has to be constantly held down while applying a pattern for it to be continuous. The tiling of the pattern is reset after the downward pressure of the mouse is released. Hint: Interesting textures to the pattern can be achieved by using textured brushes and even a variety of brushes on the same layer. The patterns at the left were created with a transparent background pattern (same pattern as used in the Pattern Overlay example) and various brushes. The Star Burst brush was used for pattern number one (1), Flat Angle brush for number two (2), and Dune Grass brush for number three (3). The mouse was held down to get a continuous pattern for both number 1 and 3. On number 2, several iterations of pressing the mouse while applying the pattern and then releasing it created the collage look. The Pattern Maker filter located in the pull down filter window is already loaded in Photoshop for version PS3 and below. However, for version PS4 and above it is an optional plug-in. It must be downloaded from Adobe's website. Pattern Maker slices an image and reassembles it randomly to create a tiled pattern. The image can be sampled and a pattern generated numerous times until you get a pattern that you like well enough to save as a pattern preset. Once saved as a pattern preset, it can then be used with the Pattern Stamp tool and Pattern Overlay effect. View "Photoshop Tutorial - Filters: Pattern Maker" and "Photoshop CS5: Tutorial Using the Pattern Maker Adobe Training Lesson 8.6" videos on how and when to use Pattern Maker. 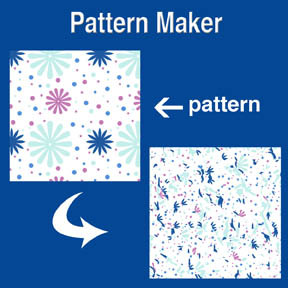 The picture at the left shows the initial pattern and the resulting scattered pattern that was generated in Pattern Maker. Using a pattern like this with Pattern Overlay or the Pattern Stamp tool makes an interesting background or border for your art collection. There are many websites that offer patterns (some free) for you to download. You can google the internet or start with "250 Free Design Patterns" and "900 Photoshop Patterns" found on artist Kate Harper's blog. Remember to get permission for commercial usage and check the copyrights before using any patterns found on the internet. • "Creating Repeat Patterns with Photoshop, Illustrator and Artlandia Plug-in Software"
• "Photoshop Tip - Easy to Create Stripes and Plaids"
As I mentioned in my article "Art Licensing: 2011 Trends" Pantone is one of the major color trend setters for the fashion, home décor, and a variety of other industries. It influences many of the industries that license art. Using "on trend" colors in their art can help artists get deals. But not all manufacturers are influenced by trendy colors. For instance, home décor products and ceramic dinnerware are not frequently replaced by consumers. And those manufacturers tend to use art on their products that have tried and true color schemes. Of course there are exceptions and accent products for the home such as pillows may follow color trends. But over all, artists must be selective in using trendy colors, know the products that use or do not use them, and know what individual manufacturers want - trendy or traditional colors. In other words, do their homework! Pantone gets the most press when they announce their color of the year. And believe me, in recent years manufacturers and retailers are well aware what is the color for that year. Manufacturers are quick to showcase their products at trade shows that have at least a touch of that years color even if it is not the exact hue. Note: Because it usually takes at least a year for products to come to market, usage of the exact Pantone Color of the Year is delayed at least a year. In other words, the exact honeysuckle hue (2011 Pantone Color of the Year) will not be seen on products until 2012 or 2013 UNLESS artists were able to predict it a year ago and convince manufacturers that it will be a popular 2011 color. Pantone poll designers in the fashion, home décor and other industries around the world to forecast the color each year. For information on how the 2011 color of the year was chosen, read "The New Hue for 2011 - How Honeysuckle Pink Was Chosen to Be Everywhere." Supposedly, honeysuckle was chosen because it is a stimulating color that lifts ones spirit due to the stress of the present economic times. Below is a list of colors Pantone selected for each year starting in 2000. And the Color of the Year for 2012 is . . . According to Pantone, Tangerine Tango as a spirited reddish orange will continue "to provide the energy boost we need to recharge and move forward." Read "2012 Pantone Color of the Year" for information about the new color and why it was chosen. 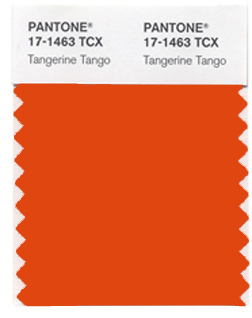 Read "Tangerine Tango could shade the zeitgeist of 2012 as Pantone's color of the year" to find out what the press and retailers have to say about the new color. And will manufacturers jump to showcase Tangerine Tango on their products at the January 2012 Atlanta Gift Show and other trade shows? You betcha they will IF they already have products with orange on them! The Winter 2012 CHA (Craft and Hobby Association) Show (January 28 - February 1) is having seminars about the craft industry but unfortunately NONE about art licensing. However, those attending the show, live or are visiting the greater Los Angles area on January 28 can still attend an information packed art licensing seminar at Annabella Hotel (on the Anaheim Convention Center Campus). Successful licensed artists Karen Embrey, Phyllis Dobbs, and Brenda Pinnick will be presenting "The New Dynamics of Art Licensing." They will discuss the creation of licensable art, portfolios, and marketing materials, color and trends, approaching manufacturers, and MUCH MUCH more. The seminar will be from 6:30 to 8:30 PM followed by optional private consultations. The seminar does not conflict with any CHA activities because it is after the CHA Meet & Greet event. For information about the seminar, read "Exciting New Seminar!" The quilt industry is huge and still going strong even in this depressed economy. To find out how large it is, all you need to do is google the word "quilt" and 85 million websites popup. A 2010 quilting survey found that the quilting industry in America is worth over three billion dollars annually with over 16 million quilting households. For more information, read "Quilting in America 2010 survey shows industry worth $3.6 billion annually." The biggest and mind boggling quilt trade show (International Quilt Market) followed by an equally amazing retail show (International Quilt Festival) is held in Houston each fall. This year the Quilt Market was held October 29-31 and the Quilt Festival November 3-6 at the George R. Brown Convention Center. The Quilt Market is to sell fabric and related quilting products to retailers. It is not open to the public. The Quilt Festival is open to the public. Thousands of people attend to purchase fabric, quilting supplies, home décor items, jewelry, clothing and gifts from over 900 vendors. 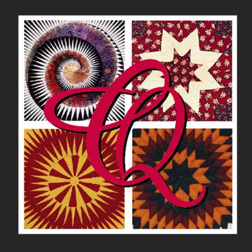 Both these events as well as two other quilting festivals and one other trade show are produced by Quilts, Inc.
For those not acquainted with quilting, it is much more than pieces of cloth sewn together to produce a bedspread. Quilted pieces are created as aesthetic and artistic works of art not only for the bed but to be displayed on walls, made into clothing, purses, totes, pillows and even into three dimensional animals and other objects. The fabric used is traditionally 100% cotton with a few exceptions such as crazy quilts. Today's quilters may incorporate many other fabrics into their projects and embellish them with lace, ribbon and beads depending on the type and how the finished pieces are used. Unlike most clothing, bed linens, etc. manufacturers who purchase designs outright from designers, many quilts and craft fabric manufacturers license art. For information about licensing to these industries, read "Licensing Designs to the Quilt & Craft Fabric Industries." According to the many articles that I read about the Fall 2011 Quilt Market, most of the manufacturers produce fabrics with traditional designs such as flowers, paisley, simple geometric icons, etc. The reason is because the largest quilting consumer base is of an older generation that wants those types of designs. 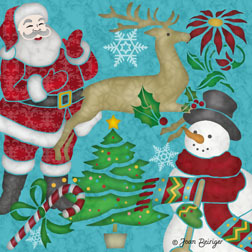 The craft industry uses iconic themes for craft fabric projects such as holidays. More contemporary designs that are suitable to be used for clothing and home décor projects are starting to appear in manufacturer lines. Below is a variety of links to articles and videos showing booths at the Quilt Market, interviews with designers, discussions on the trends, and lots of "eye candy" - beautiful and stunning creations with fabric. • a VERY fast moving video tour of "International Quilt Market Houston 2011"
• many videos on youtube.com of quilt market fall 2011 showing manufacturer booths, quilt designers, quilts, accessories used in quilting, etc. • Dana Willard (blog takes time to open but worth the wait) "fall 2011 Quilt Market recap - Houston" - many photos; describes the market and shows well known designers work. • Diane Gilleland "A Slightly Massive Look at Fall Quilt Market" photos of quilts from the quilt exhibit. • video "International Quilt Festival / Houston 2011"
Comments are welcome. Enter them in the comment section (below). Cloth can be made as woven or non-woven (bonding of fibers by thermal, mechanical or adhesives). Most licensed cloth products are made with woven cloth. Some are textile (any material made with interlacing fibers) or fabric (any material made by weaving and knitting). Kitchen towels, pot holders and mitts, tote bags, fleece throw blankets (throws) and some pillows are examples of products made with fabric. Cotton woven throws, wall hangings (tapestries) and some pillows are examples of textiles. The art themes and art styles used for these products depend on the process that is used to produce the cloth. More colors and detailed art can be used for fabric when it is printed than for hand crafted fabric or woven textiles. Kitchen towels are often decorated with borders of art or icons. Textile throws and pillows usually depict popular themes such as birds, coastal art, flowers, and kittens including niché themes like lodge animals and horses. What an artist should know and do to license art for cloth products. 1. Before submitting art to a manufacturer, make sure your art style and themes fit their product line by looking at their website. Some manufacturer websites do not show much products so google the manufacturer and product name on the internet to find their products on retailer websites. Do not waste the time of the manufacture by submitting art that is not suitable for their products. For instance, if your art style is whimsical and the manufacturer produces throws with realistic fine art images then most likely they would not be interested in licensing your art. 2. Not all manufacturer websites list submission guidelines. Contact the person in charge of licensing art for the manufacturer you wish to submit art. Ask how they want art submitted (hard copies, jpg copies attached to an email, etc.). At the same time ask if they have a list of the dates they are accepting art for particular themes (different holidays, spring, summer, fall, winter). 3. 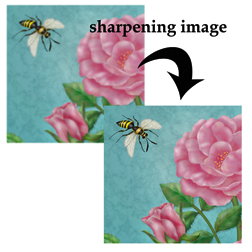 Optimize your chance in licensing your art by creating tearsheets* for the manufacturer you are submitting your art. For example, if the manufacturer produces textile throws and pillows make sure that the art is formatted as a vertical rectangle and as a square and / or horizontal if they produce pillows as horizontal rectangles. It is also a good policy to include digital mockups** of the product(s) so that the manufacturer sees your vision of the art on their product(s). See the picture at the top of this article. 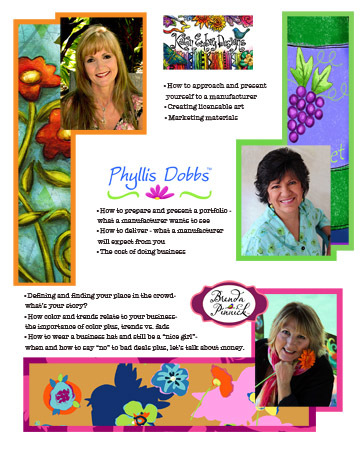 * Find out about tearsheets by reading "Marketing your Art with Tearsheets." ** Find out about digital mock-ups by reading "Product Mock-up Templates: Creating art for templates & comparison of template packages." 4. Be willing to alter your art to the manufacturer specifications. For instance, the art may need to be cropped to fit the product shape or less color hues used because of the limitations in the production process. 5. 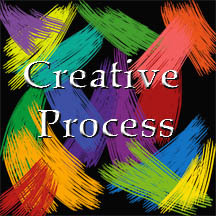 Be prepared that the colors probably will not be accurate when it is produced as a woven textile or printed on fabric. Below are links to manufacturers that license art for cloth and other products. Note: I was not able to find any manufacturers that license art for fleece throws but periodically I have seen copyrighted art on them. This family owned company have in-house designers but also license artwork for some of their products. Check out the resources section on their website for information on trends, how they design, and watch a video on a product design tour of their facility. Related article: "Licensing Designs to the Quilt & Craft Fabric Industries"
Comments about this article and sharing names of additional cloth product manufacturers not listed is greatly appreciated. Write comments in the below comment section. I find it VERY helpful to belong to linkedin groups! Members share a lot of information and resources that I may not discover on my own. For instance, illustrator Cedric Hohnstadt in the linkedin* Art of Licensing group shared that Google now has a method called "Reverse Image Search" to search the internet for images. GRIS, an acronym that I am using in this article for "Google Reverse Image Search," was released on June 14 and has received accolades from scads of people who post images on the internet. GRIS is not perfect because it does not find all images but according to persons that have compared GRIS with another image search engine, TinEye.com, GRIS is far superior. GRIS is very simple to use. All you need to do is drag a small (two to four inch wide) 72 dpi jpeg image from your computer desktop into the GRIS Search Images window. In seconds (most of the time) a list of internet sites that matched the image appears on your monitor IF a match is found. Also shown is a group of visually similar images according to GRIS although I did not think they looked THAT similar to the images I searched for. To learn the four ways to search the internet by image and watch a video explaining GRIS, go to "Google Search by Image." Note: In some of the articles that I read, people had problems with the drag and drop method but found that pasting a URL web address for the image in the search window worked for them. * For information about linkedin groups, read "Art Licensing Resource: Networking in Linkedin." GRIS does have some limitations because the algorithms used to identify images are not perfect. GRIS tends to find images on the main page of sites better than if it has to drill down through multiple pages. Also even though Google is constantly trolling the internet it does a better job in identifying images on their sites such as Blogger than other sites because the database is more complete. As a result, GRIS may or may not identify images that you know are on the internet. But as Google continues to improve GRIS, it will do a better job. Note: I tried GRIS on some images that I know is on internet sites. It identified and listed sites for several of them but not all. I also found that the size of the image that you use may make a difference in the success GRIS has in identifying images. Read my comments about this under Reasons to use GRIS / Search for internet sites selling your art / Case History of Nutcracker Image Search. I got over six million hits when I googled "reverse image search google." Obviously there is a lot of interest in GRIS. Articles discussed the announcing of this new tool in searching for images on the internet, comparing GRIS with other image search methods, and asking questions about using GRIS. Below are links to some articles that I found informative. • "Google's New 'Reverse Image Search' Helps You See Who's Stealing Your Artwork" discussion by illustrator Cedric Hohnstadt. • "Google's reverse image search: Indies Restaurant" discussion in using GRIS to find copyright infringements by illustrator Jeff Fisher. • "Google rolls out reverse image search: RIP Tineye" comparison of GRIS and Tineye by Stephen Chapman. • "Putting Google's Reverse Image Search to the Test" comparison of GRIS and Tineye by photographer William Beem. The reason why most people use GRIS is to search the internet for sites that use their images without permission. But there are also other reasons to use GRIS. Below are discussions about them. • Search for Illegal use of art. Use GRIS to find what websites or blogs are using your art without permission and without giving you credit for the art. Some individuals may be posting your art on their blogs to give content to their articles with the mistaken idea that they are doing you a service by marketing your art on their blog. Others may be "lifting" your art and selling it as their own art or putting it on products that they sell. It is the consensus on linkedin that no matter why your art is being used without your permission, the person infringing on your copyright should be informed that they are using your images illegally. You may choose to ask them to give you credit for the art, request that they license your art, or demand that they remove your art from their site. People that are infringing on copyrights should be educated that they are not allowed to put images owned by others on their site without permission. With GRIS, artists now have a better tool to find the sites that infringe on their copyrights and can contact the infringers. • Search for internet sites selling your art. The following is my experience when I used GRIS to search the internet for my recently introduced Christmas Candy Cane Nutcracker flag licensed to Evergreen International. I used GRIS with two different sizes of my art. The first time I used a four inch wide, 72dpi, jpeg image. GRIS found three internet stores that are selling my flags. But it did not find the image on Evergreen's website. Probably the reason is because a person needs to drill down five pages to find the art on their site. A person only needs to drill down one or two pages on the internet stores to see the image. When I used a smaller image (2 inch wide, 72 dpi, jpeg file) to search for the image, GRIS found the initial three internet store sites PLUS two more. The next time I searched GRIS with the same smaller image it found only four sites. Hmm, as been said Googles Reverse Image Search is not perfect. Below is the nutcracker image data from a GRIS search. I am very thankful that this image has not yet been used illegally. • Search for Internet sites that is promoting you and your art. Using GRIS is one way to find out how much exposure you and your art is getting on the internet. Are bloggers posting part of your blog articles on their blogs and linking back to your blog? Are manufacturers posting your art on their websites and listing you as the artist? Are you quoted in an article which includes a photo of yourself? All these are ways that you and your art gain exposure which may help you get licensing deals. • Use GRIS for SEO (Search Engine Optimization) link building. Driving customers to the websites of brands has become an integral part in brand building. Large brands (entertainment, food, appliance companies, etc.) often hire SEO consultants to implement SEO projects in marketing and growing their companies. Brand building for artists is different then these kinds of brands and hiring a SEO consultant costs more than most artists can afford. However, it is instructive to read how SEOs drive customers to websites. Maybe artists can use some of SEO consultant strategies to build their own brands. Read "Reverse Image Search Strategy for Outside the Box SEO Link Building" to find out how a SEO company (Zeta Interactive) uses GRIS to drive customers to websites. Note: Not every expert in the art licensing industry believes that an artist can be a brand or that it is necessary to be a brand to be successful. Using Google Reverse Image Search is an useful tool. 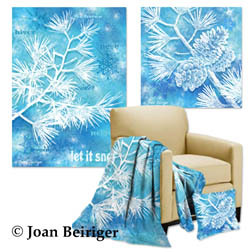 Because it is not perfect, it is recommended that other search techniques also be used on the same images such as tineye.com, and googling your name plus the word images (ie "joan beiriger images"). Comments and suggestions on how to use Google Reverse Image Search are welcomed. Please click on comments and write them in the comment window at the bottom of this article. Have you ever wondered why the art of successful licensed artists is so popular? Popularity is not only the uniqueness and the theme of the art but the emotion it emits. Art licensing agents recommend that artists paint what they love so that the emotion shines through. Of course, the trick in licensing art is to not only paint what you love but paint themes that resonate with consumers. And to do so means observing and researching the subjects and colors that appeal to consumers. Also part of the process to being successful in licensing art is to create a bond between the artist and licensing partners (manufacturers and retailers) and the consumer. Having artist signings, blogs, and doing videos help to market art and create relationships. Below are links to videos of five extremely successful artists (Susan Lordi, Jim Shore, Susan Winget, Mary Engelbreit, and April Cornell). The videos describe their inspiration and/or demonstrate their creative process of either their two or three-dimensional art. Watching these videos is not only interesting but educational. For instance, surface designer April Cornell uses the colors found in nature to create patterns for fabrics. Susan Winget and her team of illustrators have created a process to produce a large body of outstanding art for products that consumers are clamoring for. Susan Lordi of the amazingly successful Willow Tree line of inspirational figurines does extensive studying of her subjects and takes photos before she carves a new creation. Jim Shore's comprehensive knowledge of quilting and folk art and using it on his carvings has given him a signature style that is easily recognizable. And Mary Engelbreit is now adapting her storybook art to produce short animations. video "My Girls Willow Tree Figurine"
video "Jim Shore Art Influences and Style"
video "Susan Winget: My Creative Process"
video "KETC | Living St. Louis | Mary Engelbreit"
To learn more about successful licensors and view videos, read "Studios of Successful Art Licensors" and "Art Licensing Tip: Branding the Art & Artist by Marketing with Videos." Sometimes when art is scanned, photographed, created in Photoshop, or even enlarged in Photoshop it is not as sharp or as in-focus as desired. Photoshop has filters that corrects images. The easiest filters to use are the Sharpen, Sharpen Edges, and Sharpen More. The Smart Sharpen, and Unsharp Mask filters are a little more difficult to use because they have controls to adjust the amount of sharpening, adjust the radius of the pixels, remove different types of blurring, and adjust the number of thresholds in shadows and highlights. These Photoshop filters make images look sharper by controlling the contrast between neighboring pixel edges. The drawback in using these filters is that it is easy to over sharpen the images which create color halos (banding) around the sharpened pixels and results in making the images more out of focus. To avoid this pitfall you can use the High Pass filter or a none color channel in the Lab color mode. Understanding the limitations of each sharpen filter is important before using it so that the correct one is used. Below is a description of the sharpening filters and links to videos demonstrating how to use them. The Sharpen, Sharpen Edges, Sharpen More filters do not allow you to specify the amount of correction. The Sharpen More filter applies a stronger sharpening effect than does the Sharpen filter. The Sharpen Edges filter sharpens only edges while preserving the overall smoothness of the image. These filters are found under the Filter / Sharpen menu. The Unsharp Mask filter allows you to specify the amount of correction. It is used to adjust the contrast of edge detail and produce a lighter and darker line on each side of the edge. This process emphasizes the edge and creates the illusion of a sharper image. Note: Unsharp Mask filter has nothing to do with Photoshop masks and DOES sharpen images. • Video on how to use the Sharpen, Sharpen Edges, Sharpen More, and the Unsharp Mask filters "Photoshop Tutorial - Basic Sharpening"
The Smart Sharpen filter (available in version PS5 and maybe also in PS4) allow you to specify the amount of correction. It sharpens an image by letting you set the sharpening algorithm or control the amount of sharpening that occurs in shadows and highlights. Adobe Photoshop recommends that this is the way to sharpen an image if you do not have a particular sharpening filter in mind. This filter is found under the Filter / Sharpen menu. • Video on how to use the Smart Sharpen filter "Photoshop Tutorial - Smart Sharpening"
High Pass filter allows you to specify the amount of correction. It retains edge details in the specified radius where sharp color transitions occur and suppresses the rest of the image. Note: A radius of 0.1 pixel keeps only edge pixels. The filter removes low-frequency detail from an image and has an effect opposite to that of the Gaussian Blur filter. This filter is found under the Filter / Other menu. • Video on how to use the High Pass filter "Photoshop Video Tutorial - High Pass Sharpening"
If an image is sharpened in the L "color" channel of the Lab color space (L=lightness; a = the color green to magenta; b = the color blue to yellow) instead of the RGB color space (red, green, blue), color halos around the sharpened pixels are avoided. Below are videos showing two methods on using Lab color space to sharpen images. • Videos sharpening an image by using an edge mask in Lab color space. The first video of two "Photoshop Tutorial: Sharpening with LAB 1/2" And the second video of two "Photoshop Tutorial: Sharpening with LAB 2/2"
• Video sharpening an image by using several layers and masks in Lab color space. Note: This video is a little confusing and the presenter used a few four-letter words but I decided to include it in this article because the technique may be useful in sharpening some images. It is trial and error in choosing which sharpening filter to use on images because each image may be out of focus for a different reason. When using one, I usually first apply the Sharpen filter to the image because it is fast and one of easiest to use. But I enlarge the image to 200 percent to make sure that there are no halo effects and the resolution of the image is improved. If I am not satisfied I then use the Smart Sharpen filter and if still not satisfied I use the Lab Color technique with the Smart Sharpen filter. Note: I cheated when showing the out of focus example at the top of this article. I blurred an in-focus image with a Photoshop Gaussian blur filter to illustrate that Photoshop can sharpen images. The extensive amount of blurring I made to the image may not show on your monitor. There is a limit on how much the sharpening filters can sharpen out-of-focus images and the example image may be too blurred to be able to recover the sharpness of the original image by using Photoshop sharpening filters. The High Point Market is located in the city of High Point, North Carolina and is considered by many to be the world's largest trade show for the furnishings industry. It is held during the Spring and Fall (October 22-27, 2011) in 180 buildings (10 million square feet of space) with more than 2000 exhibitors of furniture, rugs, lamps, textiles, wall décor, decorative accessories and other related products. Most of the manufacturers that exhibit at High Point does not license art so why should artists interested in licensing their work look at these products? The reason is that they are displaying trends in home furnishings and those trends will affect what art is wanted by the consumers on products for the home and may move into the gift and other industries. For instance, when you read the articles and watch the videos that are listed in this blog post, you will see that black, browns and beige are starting to be replaced with brighter colors in furniture upholstery. Designs are being influenced by cultures from other countries for furniture styles, rugs, and textiles. And the eclectic look in the home is becoming very popular as mentioned by Christiane Lemieux of Dwell Studios (see article and video below) and also seen on many HGTV design shows. All these trends MAY eventually impact the colors and designs wanted by consumers no matter what kind of product. Artists that want to stay on trend should follow what is happening in furnishings as well as in other industries. The Fall 2011 High Point Market ended today and there are already many articles and videos showcasing new products and discussing trends. More are sure to follow so make sure that you search the internet for them. Below are links to a few interesting ones. • Article by home stager Joan Inglis on why designers should read articles about High Point Markets "High Point Fall Market heralds home decorating trends for 2011." Note: It is too early for Joan Inglis article on 2012 trends so this article is a little out of date. • Article by Becky Harris "10 Highlights from High Point 2011"
• Designer Libby Langdon for Braxton Culler discusses inspiration, color and creating designs for the home. • Michael Connors for Scott Thomas discusses furniture inspiration from around the world. • Christiane Lemieux of Dwell Studios "Talks New Products, Styles, and Concepts" and the eclectic look in trends. • Ronna Griest of New Massoud Collection discusses new collections, new colors and inspiration. • Jennifer McConnel of Pearson Furniture discusses colors, menswear inspired fabrics, and styles. • Accent rug introductions and discussion about inspiration from around the world with videos by Loloi, Rizzy Home and Mariachi Imports. • Home accent product introductions at the Fall High Point Market with videos by Currey & Company, Pasha Home Fashions, Uttermost and Ibolili. Comments are welcomed. Enter them in the comment section (below). Ever wonder how art is applied to products or even how the products are made? Well, knowing those things are important if you wish to license your art to manufactures. When manufacturers choose art for their products they do not only look for themes that are popular with consumers but look to see if the art can be applied to their products. For instance, some manufacturing processes requires that the art be painted by hand, others use decals to apply art to products and others use a dye-sublimation printing* process. Manufacturers of ceramic ware may use a different method to place art on their products than greeting card manufacturers. And even in the greeting card industry, some manufacturers embellish their products with embossing, die cuts, metallics, glitter, jewels, etc. while others do not. Knowing how the products are produced can help artists create designs that these manufacturers are looking for and thus optimize licensing opportunities. * To find out about this process, read Wikipedia's "Dye-sublimation printer." • Is the art in the correct format or can it be altered to fit their products? • Can the colors be reproduced accurately or at least look well with their manufacturing process? There are limitations in the color selection with some manufacturing processes. For instance, colors are limited if ceramic manufacturers depend on colored glazes or decals when placing designs on their products. • Can the art style be reproduced with their manufacturing process? If the design is hand painted on the product, intricate designs would most likely not be chosen because it would take too long to reproduce them. And yes, there are some designs that are hand painted on products such as sheet metal, ceramics, glass ornaments and stained glass. Below are links to videos showing the methods that a few manufacturers use to produce their products. Some of the videos are not made by manufacturers but the process shown is the same that they use. Note: Dye-sublimation printing is often use because of its good resolution and bright colors. It works well for products such as mouse pads, fabrics, decorative flags, t-shirts, ceramics, plastic ware, etc. Fusible decals are used to apply art to glass containers, glass jewelry, glass doorknobs, etc. When art is to be reproduced by hand onto products, manufacturers want certain art styles so that the person doing the work can produce good results. For instance, if the product is glass manufacturers often require that the original art be painted with watercolors so that the gradation of colors can be easily seen. Also the design should not be too intricate. Sheet metal manufacturers may require a decorative painting style if the products are hand painted or very realistic art if an airbrush is used. However, the art style wanted really depends on individual manufacturers. Watch "Ne'Qwa Art Fragrance Lamps" video of an amazing demonstration on reverse glass painting of artist Paul Brent's butterfly art in a Ne'Qwa ornament. The silk screen method of printing fabrics are used by many manufacturers but some use other methods. Read "Printing Process" for information about them. The dye sublimation method is used for short fabric runs, banners, decorative flags, t-shirts and other products. The links below show the dye sublimation process of printing on fabric and flags. Also silk screen like printing via direct to garment (DTG) digital printing is used for t-shirts. Google the internet to find links to other processes. Note: youtube.com has many other interesting videos that demonstrate printing cloth products. • Fabric: spoonflower.com (dye sublimation process for print on demand and custom designs for fabric) - "How does Spoonflower print your fabric?" • Dye sublimation process on Flags and Banners: "Velotex Direct Dye Sublimation Textile Printer"
• T-shirts: "DTG Epson 1390 Direct to Garment T-Shirt Printer.MP4"
Many manufacturers of these products use a dye sublimation process to place art on them. The ceramic needs to have a polyester polymer coating on it so that it absorbs the dye when placed in the heat press. Some ceramic manufactures use decals and /or glazes to decorate their products. These products are fired in a kiln multiple times at various temperatures to achieve the effect that is desired. Decals are applied last and fired at a lower temperature than the previous firings. Below are several videos demonstrating these processes. • Ceramic Plate (dye sublimation process): "Dye Sublimation to a Porcelain Plate Instruction"
• Ceramic Tile (dye sublimation process): "How to Sublimate a Single Tile"
• Ceramic Mug (dye sublimation process): "Sublimation Process Photo Mug"
• Noritake China (decal process): "Noritake: The Standard of Perfection Part 3" and "Noritake: The Standard of Perfection Part 4"
Art is adhered to melamine plastic products either by the dye sublimation process or by embedding a printed image between two thin coats of melamine and curing the melamine layers. Read "What is the Process for Printing on Melamine Plates?" to learn about the embedding process. Look at the "Efay Melamine tableware" video to see how melamine dishes are manufactured. Offset printing presses are often used to print images on large batches of greeting cards and gift bags. Some cards and bags are embellished with cutout shapes, embossing, metallic foil, glitter and jewels. Specialized machines are used to adhere the glitter and foil to the paper, die cut shapes, and emboss the products. Below are videos showing some of these processes. • Greeting Cards (offset press and die cut cards and envelops): "How a Greeting Card is Made"
• Adhere metallic foil: "Hot Stamping Digital-Diginove"
• Adhere metallic foil: "How to foil on laser printed images"
•Making Gift Bags: "gift bag making machine"
KNOWLEDGE IS POWER and knowing how manufacturers produce their products help artists create art that is needed. For instance, greeting card manufacturers that embellish their cards with metallics and glitter need art that have lines and outlines incorporated into the art for placement of metallic foil and areas for glitter. Knowing that a manufacturer is limited in the number of colors, as is often the case with printed fabrics, the artist can create art with a limited number of colors. And if the manufacturer produces hand painted products, an artist can submit the right kind of art and art style for licensing consideration. Connecting with others via social media is all the rage especially on Facebook. Some manufacturers that license art are taking advantage in the popularity of social media by staying in touch with their customers (retailers and the consumers who purchase their products). They use Facebook to introduce products, talk about subjects of interest to their customers, announce giveaways and contests, and link to articles and special events. Retailers and consumers comment about the manufacturer product line and ask questions on where to purchase products or give suggestions on new themes and products. To learn more about why manufacturers are using social media, read "Business Connection - Social media markets integral part of business strategy." The Lang Company "thinks out of the box" to entice people to their Facebook Page by periodically putting on Chat Events with their artists. Interested persons can log onto Lang's Page and ask questions of the artist during the event while the artist stays online to answer them. Artist Lisa Kaus did Lang's artist Chat Event last week. Last year, I had a chance to ask artist Susan Winget a couple of questions during her event. I found this type of online interaction very interesting and informative but somewhat slow in response time. You do not have to sign-up with Facebook to view the posts on manufacturer pages. However, you do need to have an account if you wish to leave a comment or ask a question, and search for manufacturers that are on Facebook. Signing up with Facebook is free. So why should artists look at manufacturer Facebook Pages? The reason is to learn about new product introductions, find out the art themes that manufacturers think are on trend, and find out what is selling well at retail. The more information that artists learn about what art (themes, colors and styles) is popular with consumers, the easier it is to create art that is licensable. Below are links to some manufacturer Facebook pages. Note: Some manufacturers have very active pages while others do not. Any additional links to manufacturer Facebook pages or comments that you would like to share about this article would be greatly appreciated. Click on the comment section below. Adobe Photoshop is the most used software in art licensing for manipulating and creating art. It uses a native format of PSD but allows a person to save files in other formats such as JPEG, PNG, TIFF, PDF, EPS. Before saving a file to another format, it should ALWAYS be saved in Photoshop's native format (at 300 dpi or more) to preserve all Photoshop features such as layers. That way the artist can do future editing of the images and text contained in the layers. The other formats will be used for other purposes such as submitting low resolution art (72 dpi) to manufacturers for possible licensing, submitting art in formats requested by manufacturers, and placing art on websites. This article describes the pros and cons of these alternative formats and when to use them. The most used format to transfer art in the licensing industry is JPEG (Joint Photographic Experts Group). It was created in 1992 to compress files to make them smaller in size and faster to download and open. The degree of compression can be adjusted to allow a tradeoff between storage size and image quality. JPEG files can be read by most software and has the filename extension of .jpg. - Significantly compresses the file size. - Saves an image in CMYK, RGB, and grayscale mode. To find out the difference between CMYK and RGB, read "Photoshop Tip: When to Use RGB and CMYK Color Gamut." - Saves an image as one or more JPEG using the Save For Web & Devices command. - Can save as a progressive download which loads faster and saves space. This way, after a smaller part of the whole file has been received, the viewer sees a lower quality version of the final picture. The quality then improves progressively through downloading more data bits from the source. - Most software supports it. - Uses lossy data compression of the file size by selectively discarding data. It degrades the resolution of the image EACH time the file is saved. Note: Theoretically lossless data compression (no loss of data) is possible with a JPEG file but must be built into the software. Photoshop does not give that option. - Automatically adds a white background if it was transparent. - Merges all layers into one layer. - Supports only 8-bit images. * If a larger bit image is saved as a JPEG, Photoshop automatically lowers the bit depth to 8. - Some software applications may not be able to read a CMYK file saved in JPEG format. - Send low resolution art to manufacturers via e-mail for licensing consideration. - Send high resolution graphics to trade publications via e-mail for paid advertising. Because the file is compressed significantly, the size of the file is small enough to download faster than other formats. Note: I have experienced good results (color and resolution) when sending a 300 dpi RGB JPEG file (with my own embedded color profile and at the size it will be printed) via e-mail to Total Art Licensing and Art Buyer publications. - Can be used for low resolution art on websites and blogs. - Can be used to reduce the file size to increase file transfer speed on the internet. - Can be used to reduce the file size to increase the speed when printing marketing and other materials on home printers. - Send a high resolution file to a manufacturer once a licensing contract is signed. Select the baseline optimized to optimize the color and have a slightly better compression. *8-bit images means that each pixel in an image (the dot that makes up the smallest part of an image) can represent 256 different states (2 to the 8th power) or over 16 million color shades in the RGB color system (256 times 256 times 256). Until recently most monitors, inkjet printers, and other devices could only show 8-bit images. 8-bit images are also called 24-bit images (3 times 8). Now scanners and digital cameras are capable of producing higher bit images such as 36-bit and 48-bit (billions of colors). These higher bit images may be used in high quality digital photographic work but is not used for licensed art on products. The printing devices does not support that many colors. Thus, 8-bit images is the norm used in art licensing. Note: Some printing devices support MUCH less colors than available for 8-bit images. JPEG 2000 was created by the Joint Photographic Experts Group in 2000 with a filename extension of .jp2 or .jpf to enhance the original JPEG capabilities. It supports all JPEG capabilities plus more. - Supports everything that JPEG does. - Provides both lossless (no loss of data when compressed) and lossy compression. - Saves an image in CMYK, RGB, and grayscale mode. - Artifacts in file compression is less visible. There is almost no "jaggies" around the edges of the image. - It supports transparency in images. - It supports higher bit depths. - Does not have widespread usage. - Not widely supported by all web browsers especially the older ones. - Not supported by all graphic software. - See JPEG format uses. - Can be used to save icons and images with transparent backgrounds. They can thus be easily incorporated into other pieces of art and patterns without having to remove the background. Caution: It is better to use the original JPEG format instead of JPEG 2000 unless it is requested by a manufacturer. It is not recognized by all software and the file may not open. PNG (Portable Network Graphics) format is used for lossless file compression with a file extension of .png. It compresses a file without losing bits of data unlike JPEG formatted files. PNG was designed for transferring images on the Internet and not for professional-quality print graphics. - Can save 24-bit images. - Supports RGB, Indexed Color, Grayscale, and Bitmap mode images without alpha channels. - Preserves transparency in grayscale and RGB images. - Not ALL web browsers can read PNG images, although the later generation browsers do. - Does not support CMYK images. - Can be used to save icons and images with transparent backgrounds. Images without backgrounds saved as PNG files can be easily incorporated into other art and pattern files without having to remove the backgrounds. - Can be used to display high color images (greater than 8-bit). TIFF (Tagged Image File Format) file format was originally created by Aldus for use as desktop publishing for image-manipulation, publishing, and page layout applications with a file extension of .tif. It was acquired by Adobe Systems in 2009. - Can handle images and data within a single file, by including the header tags (size, definition, image-data arrangement). - Supported by virtually all paint, image-editing, and page-layout applications. - Can save 32 bit images. - Preserves transparency in images. - Creates larger files when no compression is used and also if the file includes many layers. Thus, it takes a long time to download and uses a lot of disk space. - If an application cannot read the layer data, it opens the file without layers. - Not supported by web browsers. - Has not been updated since 1992 and thus lacks advanced imaging features. - Scan images in TIFF format without compression selected. The details of the image will be maximized but scanning the image may take a long time, have a large file size, and take a long time to download. - Take digital photos with TIFF format (if camera supports it) for a better quality photos than JPEG. However, the files are huge, less photos can be stored on the memory chip, and results in a longer wait time between taking photos so that the data can be transferred to the memory chip. The quality may not be noticeably better than JPEG. Note: Many digital cameras can save files in RAW format which is the best quality photos. RAW format is supported and editable in later versions of Photoshop. However, RAW format is a proprietary format for each camera manufacturer and may not be readable by software in future years. Thus, RAW formatted files should be converted to TIFF or JPEG for archival storage. - Manufacturers may request a layered TIFF file so that they can manipulate the image to their own specifications. Of course, this file will only be sent after a licensing contract has been signed. PDF (Portable Document Format) was created in 1993 by Adobe Systems for document exchange and is the de facto standard for printable documents on the web with a filename extension of .pdf. Depending on the settings chosen, compression and downsampling can significantly reduce the size of a PDF file with little or no loss of detail and precision. - Gives multiple choices in compression and ways pixels are deleted. - Supported in most graphic (vector and raster) and page layout applications. 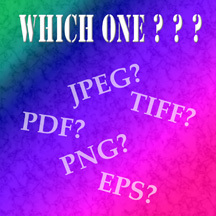 - PDF Format in Photoshop only allows one image to be saved per PDF file. If multiple images need to be saved in one PDF file, use Adobe Acrobat software. Note: Artist Laura Freeman pointed out that you CAN save a multi-page PDF file in older versions of Photoshop. Read how to do it in the 4th comment to this article. And read comment #5 on how to create a multi-image PDF file in Photoshop versions CS4 and CS5. - Manufacturers may request a layered PDF formatted file if they do not own Photoshop but have other software that will read layered PDF files. - Many artists use Acrobat software (PDF) to send multiple images as one file to manufacturers for licensing consideration. Note: If you use a PDF file with multiple images, make sure that the file is compressed and not too large or the receiver may not be able to open it with their e-mail reader. Many readers limit the file size that is attached to an e-mail. An alternative is to put the PDF file on a CD and post it (mail) to the manufacturer. Photoshop EPS Format (Encapsulated PostScript) language file format has a file extension of .eps. EPS format was created for vector generated graphics in Adobe Illustrator but does support bit mapped (raster) graphics. For more information, read "What is the Difference between Photoshop and Illustrator?" - EPS format supports Lab, CMYK, RGB, Indexed Color, Duotone, Grayscale, and Bitmap color modes. - Can save color separations of CMYK images. - Can contain both vector and bitmap graphics. - Is supported by virtually all graphics, illustration, and pay-layout software. - When a EPS file containing vector graphics is opened in Photoshop, it rasterizes the image, converting the vector graphics to pixels unless it is downloaded as a Smart Object. Smart Objects preserve an image's source content with all its original characteristics, enabling you to perform nondestructive editing to the layer. - Transfer PostScript artwork between Photoshop and other software such as Adobe Illustrator. - Send a high resolution EPS file to a manufacturer if it is requested and once a licensing contract is signed. Note: This is NOT an usual request so make sure that the manufacturer understands that the art was generated in Photoshop as a bit mapped image (raster) and is not a vector image. As a raster image, the resolution will degrade if the file enlarged too much while a vector image does not degrade when enlarged. The size of the file is dependent on whether the file is compressed, the type of compression, and the number of layers in the file. 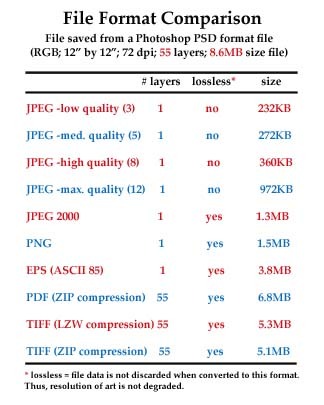 Below is a table comparing the different formats when converting a Photoshop RGB 12 inch square image at 72 dpi. Notice that a maximum quality JPEG file with one layer is only 972KB in size while a TIFF file with 55 layers and compressed as a ZIP file is 5.1MB. Not shown in the table: The same file at 300dpi JPEG (maximum quality) is 4.9MB while a 300 dpi TIFF file with 55 layers and ZIP compression is 133.6MB. The same file with no compression is 146.1MB in size. The most used format for showing art on websites and blogs and submitting low resolution art to manufacturers is JPEG. Although, using PNG files is becoming more prevalent for showing art on websites and blogs. I usually submit art to manufacturers at 72 dpi in RBG at a medium quality JPEG file. I have found that a high resolution (300 dpi) JPEG file of the final art is usually the most requested format by manufacturers. Of course, it is sent to the manufacturer AFTER the licensing contract is signed. Some artists and agents send multiple images in a Adobe Acrobat PDF file (either by e-mail or CD via "snail" mail) to manufacturers for licensing consideration. Saving PNG files of individual images and icons without backgrounds is a good practice because PNG is lossless and supports transparent backgrounds. TIFF files are readable by all graphic software, is lossless, and supports layers but the file size can be huge and take a long time to upload. If you would like to share information on how you use the different formats or any comment about this article, please enter them in the comment section below.